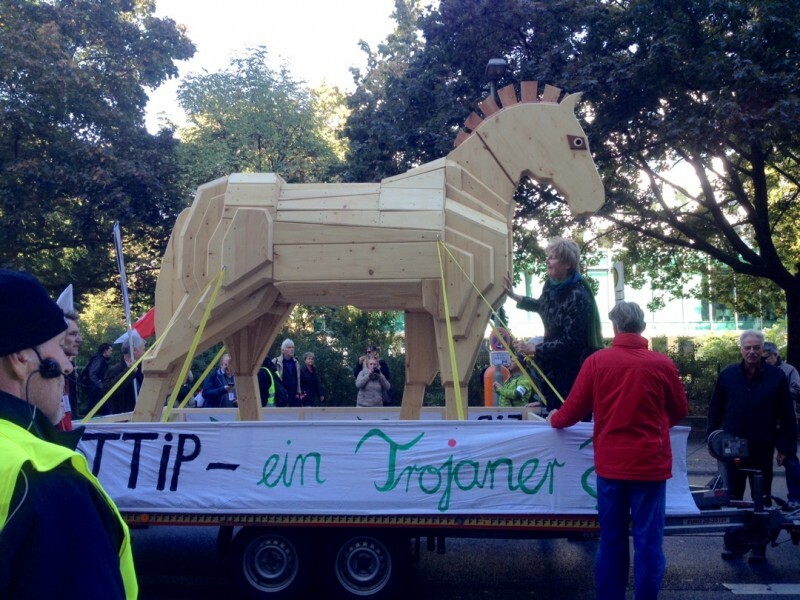 With an estimated 250,000 people in attendance, the Berlin rally to stop the TTIP agreement was next level. Shot from the top of the famous Victory Column in Tiergarten, the below video shows the mass of protesters stretching all the way back to the Brandenburg Gate and beyond. The event kicked off at the Hauptbahnhof station, with Tango dancers dancing in protest against the TTIP. The below gallery of pictures shows the progression of events, from the march forming and commencing their 5.5 kilometre walk through Berlin’s Mitte district, past the Bundestag and Brandenburg Gate, completely shutting down the boulevard at Tiergarten and arriving at the rally at the Victory Column. This has been best summed up by WikiLeaks in a short video about multiple regional U.S.-centric ‘free trade’ agreements currently being decided — the Trans-Pacific Partnership Agreement (commonly known as the TPP or the TPPA); the Trade In Services Agreement (known as TISA) and the Trans-Atlantic Trade In Partnership Agreement (called the TTIP). These agreements are often treated as different or separate issues by people in the affected regions, but they are really three Medusa heads of the same damaging protectionist policies that have grossly failed citizens in the past. This time the threat is even more severe, however, in that they contain provisions for an Investor-State Disputes Settlement (ISDS) process which supersedes local and international law by assigning decision-making and legal powers to corporate tribunals that can rule above the local laws of the affected nations. Public resistance and civil disobedience in opposition to the proposed agreements tracks back years. Activists from the United States, Japan, Australia, New Zealand, Indonesia, the Philippines, South Korea and many other countries, have held coordinated action days and spread information since at least 2011, with major international actions grabbing headlines in 2012 and ever since. Held to coincide with the negotiation rounds of the agreements, the public pressure has been immense and in some places the issues have gone very mainstream, with one negotiating trade minister complaining that protesters were achieving pervasive levels of coverage in the news media. From experience we know that only hard and prolonged campaigning can result in a lasting breakthrough to the mainstream and generate movements of this size. Now it remains to see what, if any, meaningful answers the politicians of the populaces involved have for their constituents, who are hoping these agreements won’t just be rammed through regardless, as so often seems the case. With the huge turnouts at European events this weekend, it seems that, even if the TPP is ratified, there is still hope that other regions can resist the trend.